Ramblings of a Daydreamer: Blue Sky Days is available NOW! Blue Sky Days is available NOW! 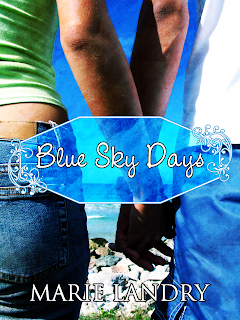 Well, it's about a week and a half early, but Blue Sky Days is now available on Kindle! Here's the thing about being an indie author: everything is up to you. That's great, but it can also be really nerve-wracking. I feel like I've been on a never-ending merry-go-round the last several months. I had tentatively set the release date for January 17th, but never having uploaded a book to Smashwords or Amazon before, I was afraid I would have issues - that the file wouldn't upload or the formatting would be wrong, or any other of a number of problems that would lead to the book being late, which would be awful since the blog tour starts the 17th. So I went ahead and uploaded the file to Smashwords and Amazon last night, which means that Blue Sky Days is now LIVE and available to buy in the Kindle Store!!!! I'm so excited, I can't even tell you. In case you're wondering what this means for the launch party, that date will remain the same - the 17th. I'm keeping that date as the 'official' release date because by then, the book should be available everywhere ebooks are sold, not just Amazon. The tour also starts the 17th and runs for four weeks. Four whole weeks. I'm still mind-boggled by that. Be sure to drop by for the launch party - details here - because I'm going to be giving stuff away! Who doesn't like free stuff, right? Also be sure to check out the tour schedule - there are some incredible bloggers participating! Blue Sky Days will also be available on Barnes and Noble very soon, and in the meantime, if you'd like to buy the book in every imaginable format, it's also available on Smashwords. Congratulations! I'll be buying & reading it soon! Congratulations! I'm following your blog now, love it! Putting Blue Sky Days on my TBR List. Congrats! That's so exciting. :) I'll have to get it for my Kindle as soon as possible. Bought the epub from Smashwords and will buy again when it hits B&N but question: is there a difference in the cut you get from each retailer? Just wanting to make sure you get the most profit for each sale. Keith has a great point. Since your book is just releasing every little bit helps. :) Personally I'm looking forward to getting a physical copy of it. I don't think I'm ever going to get use to feeling like I own a book through an e-Reader. *Maybe* when / if Kindle Fire is available to Canadians? I miss color covers. Blue Sky Days is a breathtaking story of true love with beautifully written prose capable of making mundane things become magical. I loved it! I hope that can help you a little with conquering the pre-book (or is it post book now? Kinda makes it a shade of gray, doesn't it?) jitters. Relax! Everything is going to go great!